Posted August 6, 2015 by Luke Keil & filed under Latest Fishing Report. Here at Wyoming Anglers we consider ourselves very blessed to have such a fun, experienced, and hard working group of Wyoming fly fishing guides. They will undoubtedly work hard to keep you hooking fish all day long. You will come away from your trip remembering it as being one of your most productive and exciting day’s of fishing you have ever had! Many consider our local Casper guide staff to be the best, most well rounded and diversified group of Wyoming fly fishing guides on the North Platte River! Don’t take our word for it, read our guest testimonies. Hooly Henson is going on her second year with WA. She has been a great addition to our company and Wyoming fly fishing guide staff. All of our guides are great at being patient and teaching the art of fly fishing, but Hooly brings a new dimension. She will keep the avid angler on fish all day, but if you want to send your wife or daughters on a float trip, Hooly will undoubtedly turn them on to fishing and keep them laughing the whole way! She has the touch a man can’t mimic! Mark Schmid grew up in Livingston Montana where he learned to fly fish on the Yellowstone River at the age of 7. He started guiding on the Yellowstone, Madison, Gallatin, and Big Horn river’s before he began his career as a fishing guide in Wyoming. Mark is a 12 year veteran guide here on the North Platte River. He has been guiding as long as any guide around. He was formerly the Head Guide for Crazy Rainbow Fly Fishing in Casper Wyoming, before moving on. He has since then been guiding for Wyoming Anglers and we are excited to have him on board! He is a very patient, professional, and knowledgeable Wyoming fishing guide. Carl Myers started guiding professionally over 13 years ago and has yet to kick the addiction. The only thing that equals his passion for fly-fishing is his desire to share its’ joys by teaching others about it. His military-bred work ethic, experience as a school teacher, and years of introducing new anglers to fly-fishing all work together to create a patient but intense guiding style that provides an effective approach for helping clients learn about every aspect of this great sport. There isn’t a more fun and relaxing place to be than in a drift boat, and there’s no better feeling in the world than an arm sore from wrestling with the North Platte’s legendary rainbows and browns. So hop in, hold on, and enjoy the ride. Fish On! 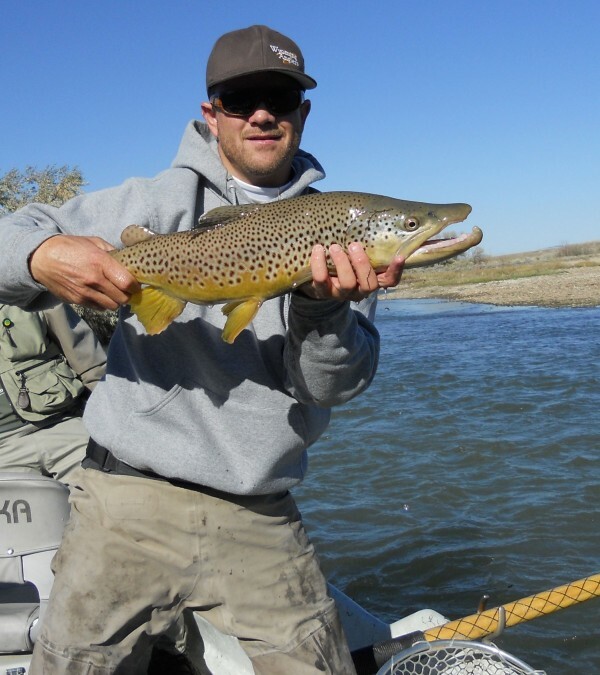 Luke Keil is owner/head guide of Wyoming Anglers guide service. He considers him self very blessed to be surrounded and working with such a great team of friends and guides. He has nearly a decade of experience and has an undying love for the sport of fly fishing. His vision for Wyoming Anglers is to become the most admired and respected fly fishing company in the industry. Being surrounded by such a great group of people is making this dream a reality!